The Introduction to Image Analysis Techniques Using Earth Science Data workshop is at maximum enrollment. We cannot accept any further registrations for week 1. We are also at maximum enrollment for "Advanced Image Analysis Techniques Using Earth Science Data" workshop. The advanced workshop may reopen for registration if we have withdrawals. We expect to know more by July 15th about the availability for stipends for the advanced course . The EET Workshops project, together with the Eyes in the Sky II project, is offering summer professional development for science teachers in grades 6-12 in the form of week-long virtual workshops. Teachers must have access to computers with Internet connectivity and be willing to use data analysis techniques to help their students better understand Earth through investigating global and local environmental issues. Participants should be teaching science courses during the 2011-2012 school year. Staff development specialists and university faculty working with science teachers are also encouraged to take these workshops in order to help teachers incorporate data analysis techniques into their curriculum. During the workshop, participants are expected to follow online instructions, complete daily assignments, share results, and contribute to discussions. Participants should set aside 8 hours per day for workshop activities. Each day, facilitators will host an optional one-hour daily question and answer session. The time of the session (5 PM Eastern daylight savings time) will vary according to the time zone in which participants reside. For example, for participants living in California, the session will take place at 2 PM Pacific daylight savings time. To take part in this opportunity, participants need an Internet-connected computer and the ability to talk on the telephone at the same time. The workshops use Elluminate web-conferencing software. Attendees will receive a $1000 stipend after completing all workshop activities. 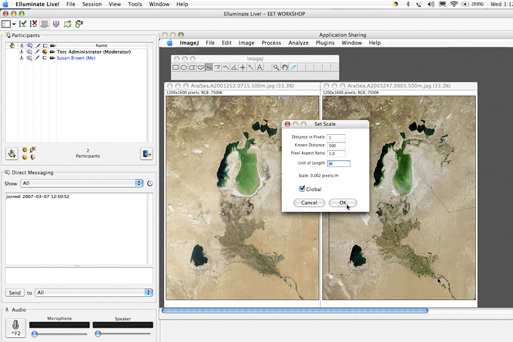 Description: Learn to download and access freely available earth science data and conduct basic analysis techniques using ImageJ, a public domain image analysis program. Gather data from the NASA Near Earth Observations (NEO) web site and learn to use its built-in java program for image analysis. Description: Learn to download and access freely available earth science data and conduct advanced analysis techniques using ImageJ, a public domain image analysis program. Also learn to carry out advanced techniques image analysis techniques in NASA Near Earth Observations (NEO). NOTE: You do not need to have attended the first workshop to participate in the second one. You do need to have had prior experience with basic ImageJ techniques, such as working with stacks and making measurements, plus basic experience with the NEO web site. If you have any questions about participating in these workshops, please contact Carla_McAuliffe@terc.edu.